The White House blocked government scientists from warning the American public of the potential environmental disaster caused by BP’s broken well in the Gulf of Mexico, a report released by the national commission investigating the oil spill said yesterday. The report, produced by a panel appointed by Barack Obama to investigate the spill, said that about two weeks after the BP rig exploded scientists from the National Oceanic and Atmospheric Administration (NOAA) asked the White House for permission to release their models showing their worst case scenarios for the spill. The White House office of management and budget, which is a traditional clearing house for decisions, turned down the request, the report said, quoting interviews with administration officials. The report, one of four released today by the commission, provides the most compelling evidence to date of direct attempts by the White House to spin the BP oil spill disaster. The White House disputed the commission’s findings. “Senior government officials were clear with the public what the worst-case flow rate could be,” the acting director of the OMB, Jeffrey Zients and the NOAA adminstrator, Jane Lubchenco, said in a statement. The commission report does not explore why the White House sought to block the worst-case scenarios for the spill. The report amplifies scathing criticism last week by the commission’s co-chairs, Bob Graham and William Reilly, of the Obama administration’s handling of the disaster. It goes on to catalogue other lapses by the administration, including repeated underestimates of the size of the spill, and downplaying the environmental damage after the BP well was capped. It said Browner was overstating the findings of a NOAA analysis of the fate of the oil. “By initially underestimating the amount of oil flow and then, at the end of the summer, appearing to underestimate the amount of oil remaining in the Gulf, the federal government created the impression that it was either not fully competent to handle the spill or not fully candid with the American people about the scope of the problem,” the report said. The documents for the first time put the White House at the centre of the long running dispute between the administration and independent scientists about how much oil was discharged into the Gulf, and how much remains in the water. 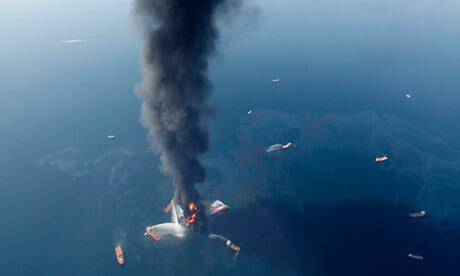 At first, BP claimed the well was leaking 1,000 barrels a day. By early May, the administration had revised its estimate upwards to 5,000 barrels a day, but based its assessment on the work of a single NOAA scientist using “overly casual” analysis of satellite images of oil on the surface of the ocean. The administration clung to that estimate – which turned out to be 12 times lower than the actual spill size – despite known inaccuracies in the scientists’ work, the report said.